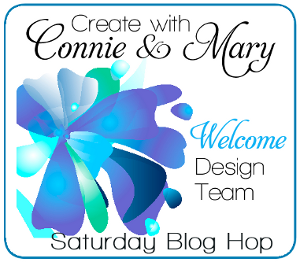 Welcome everyone to the Create with Connie and Mary Design Team Blog Hop! Each of the design team members is taking turns suggesting a theme and this month we are doing Folds. Deb Currier is up this week and she picked the Tunnel card.. If you are going forward in the hop you arrived here from Connie Babbert’s Inkspired Treasures blog. I always LOVE what she does! Don’t you just LOVE the new Definitely Dahlia stamp? This was one of my very first ‘must have’ stamps from the new catalog. I just LOVE it and there is so much you can do with it. Timeless Elegance dsp – 1 1/2 x 3 5/8, add to panel. 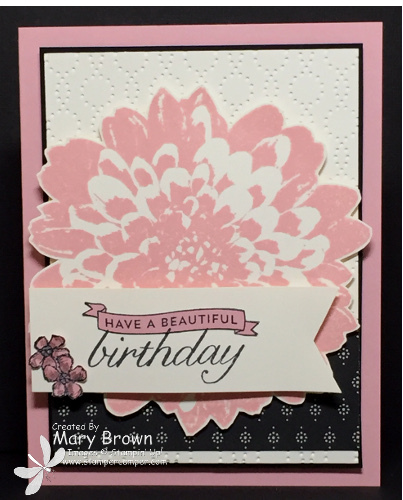 Stamp Definitely Dahlia using Blushing Bride on Very Vanilla, cut out and add to card front using dimensionals. Stamp flowers using Memento Black on Blushing Bride, cut out and add to banner. Blushing Bride dsp (Subtles paper pack) – 8 1/4 x 5 1/4, score along the 8 1/4 side at 2, 4 1/8. 6 1/4, cut out the window using the largest Tags and Labels Framelits. Timeless Elegance – 3 3/4 x 3 (same print as the front), sut out the window using the next to largest Tags and Labels Framelits. 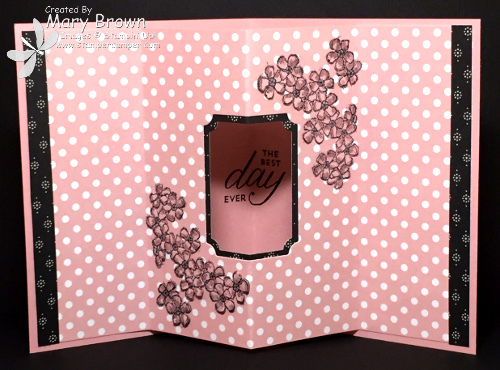 Lay this piece centered on the inside of the card and stamp greeting using Memento Black and the fold card in half. This helps to reduce the bulk of the card by not adding an extra layer inside. Fold the Blushing Bride dsp (valley folds on the ends, mountain fold in the center), add ends to inside card. Stamp the flower stamp twice on Blushing Bride using Memento Black, add highlights using Blushing Bride marker and color centers using Smoky Slate. Cut out and add to inside card to finish off. How fun is that? Really not that difficult of a card but makes the inside special for someone special! And speaking of someone special, now it is time to head over to Nicole Tugrul Be Creative with Nicole site and see the special card you made! This entry was posted in Create with Connie and Mary, Saturday Blog Hop and tagged Birthday Blossoms, Definitely Dahlia. Bookmark the permalink. Very sweet, love the CAS inside! That is such a pretty card but to much for me to do. As I am not a crafty or patient person. But I admire those of you who are crafty.